Learn about how to choose your space based on the type of fitness business you operate and how space condition & cost, size, laws & codes, and design considerations affect your choices. The cost of having the best location can be high, but the cost of having a poor location could be much higher. I’ve always been with the mindset that you pay for your rent in one way or another. One being in the base rent itself, providing a highly valued, visible and desirable location. The other being quite costly in marketing, lower membership values and several other unseen items that add to the cost along the way of having a less than desirable location. In many cases, the budget ratio for a facility’s rent can be as high as 30% of the budget. If you have elected to go the route of a fitness studio, specifically a personal training or group fitness studio, you know your space will need to be compact and should have minimal overhead to be sustainable. Studios today typically do not require much equipment, so this means your initial investment will be lower than that of a full service fitness facility. As noted in the introduction article; The Business of Fitness, one of the first steps to planning your fitness facility business is to determine whether you go into business as a franchisee or build your own model and brand. This is important for many reasons, but specifically focusing on space selection, you will need to address any requirements put in place by a franchise organization. Otherwise, you will be left to your own needs and specifications on space selection. One of the contributing factors to a space and its value can be the existing improvements that it has. For example, you might consider two water closets or restrooms being a plus if you are opening a fitness studio with limited amenities. In this case it could save you a great deal of cost in plumbing, relocating existing plumbing and several other key points that could reach several thousand dollars before you have created what you are looking for in the space. Another point, you might not be planning to have showers if you are opening a simple studio, so this scenario could be a plus. Another example of a great situation is, the space might have a concrete floor, with this you can save $1.00 to $2.00 per sq. ft. in most cases in just removing existing floor covering such as carpet. If the space is open, then you could save thousands of dollars on demolition of existing walls that might be there from previous tenants. Pay attention when you visit the properties, take pictures and video. Video will afford you more opportunities to see the small things, details that don’t always surface with just still shots of the space. Knowing what you are seeing and what you are looking for are smart moves when selecting a space. You might have three or four options on locations and one of the leading reasons you could select one is based on the current condition. Parking availability is an important consideration. The need for parking will also vary depending on the local, both suburban and rural. In the study IHRSA Research Report, Donald DeMars of Donald DeMars International suggested for every 1,000 sq. ft., a fitness facility should allot 5 parking spaces. Another contributor to this report, architect Hervey Lavoie of the Ohlson Lavoie Corporation suggests 1 parking space for every 12 to 15 members. Spend time understanding the local laws and building codes. Knowing what is required in your particular city or county could save you a small fortune and certainly a lot of frustration. Be conscious of the codes for fire, electrical and plumbing. Knowing the use of your space and how it is classified. You could be required to have a larger number of fixtures in your restrooms, and everyone must be ADA compliant. Knowing what the requirements are for parking will require the use or code that the enforcement office labels your business with. A great starting point is with a local general contractor to learn more about the most common items, but its advised that you speak directly with the enforcement office to get the regulations, requirements and any particular laws that you will be facing as you locate, secure and improve your location for your new fitness business. After all is said and done with the space consideration and reaching an agreement with the building manager or owner, one of the most important points to cover is design. Ask yourself this question: How can I create the ideal fitness experience for my members and clients?. When working with your space, it is highly recommended that you hire a designer that is experienced and familiar with fitness facilities. Someone that has not only designed and been involved in the building process, but also with managing, and better yet, owning and operating facilities of their own. Having first-hand knowledge of what is accepted in the business, certain needs for specs in the way of electrical needs, low-voltage needs for technology, build-out, and several other key design elements will prove to be highly valuable and simply a smart investment. Your designer should understand the inner workings of your fitness business model, from the mindset of your members to the needs of small group and group fitness programs. Your design consultant should have proven practical experience with flooring types and uses, functional fitness and functional training programming and applications. Particular attention should be paid to the storage needs of your facility. Today, our industry uses far more accessories and tools to meet the needs of our clients. 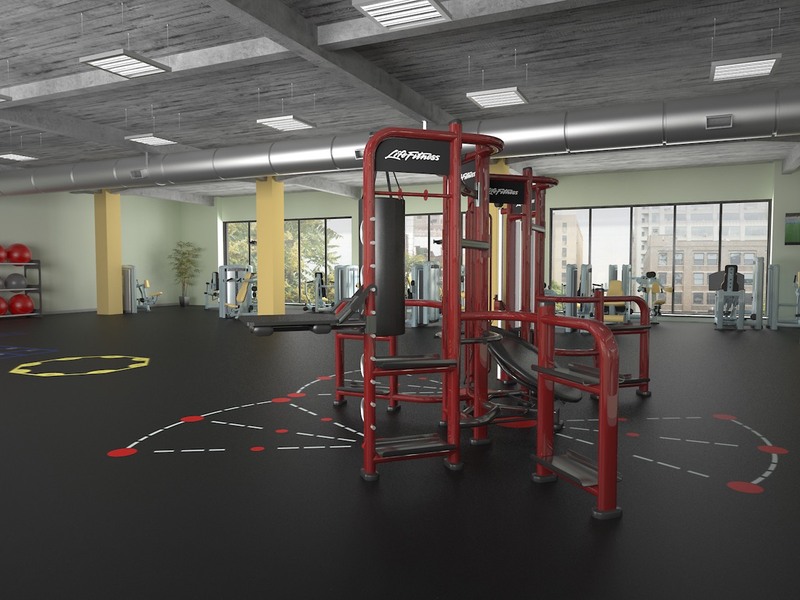 We need to store them properly and orderly so that exercise areas are developed to be safe for members, and all exercise equipment, tools, and accessories remain safe to use in the facility — and allow quick access for your clients, employee’s or staff. It is important that design elements follow or set the current trends in fitness. Design is key for providing you with multiple options to maintain control of the traffic in your facility to enhance fluid, natural, and suggested movement throughout all exercise areas. Are you looking for help choosing your fitness space? If you need help learning how to choose, design, or redesign your space, we want to hear from you. After you contact us – don’t forget, we can support your facility, website, personal training, and group exercise programs. Yes, it’s free – always.